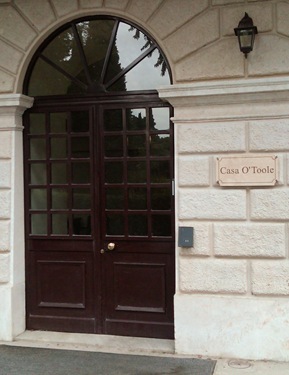 This week, I have been in Italy for a meeting to prepare for my upcoming apostolic visitation to Ireland. 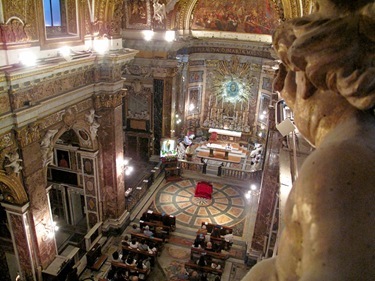 As I like to do when I am in Rome, I celebrated Mass at my titular church there, Santa Maria della Vittoria. Last Friday was the Feast of St. Thérése of Lisieux, also known as St. Thérése of the Little Flower. 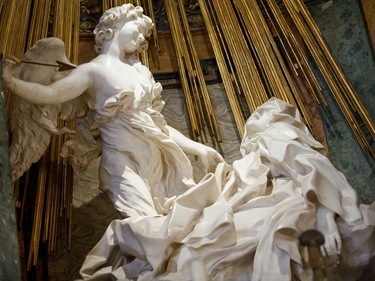 It was after she visited this church that she had an audience with Pope Leo XIII. 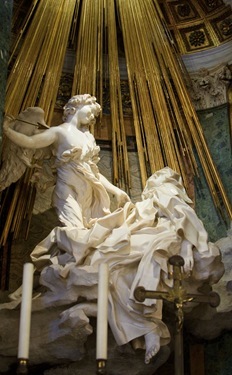 He was sitting on the Papal throne, and she went up and grabbed his knees and begged him for permission to join the convent even though she was only 14 years old. This year, I was joined at the Mass by some of the Carmelite friars who staff the church, including their provincial superior. A couple of priests from the neighboring parishes joined us as well. 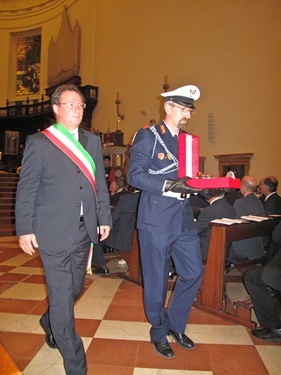 While I was at Santa Maria, I was visited by the new Italian consul general in Boston, Giuseppe Pastorelli. 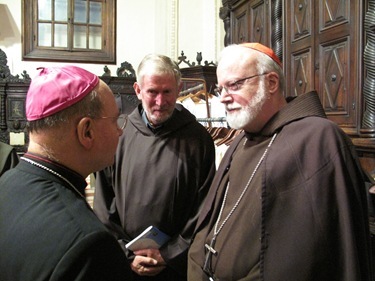 He is coming to Boston a couple of weeks, so when he learned the Archbishop of Boston was having Mass in the church he came to pay his respects. 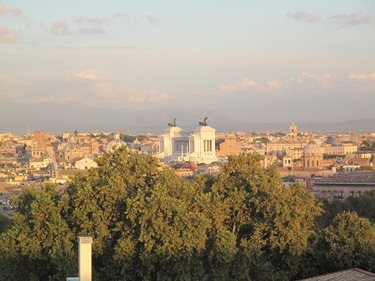 Earlier that day, we went to the North American College, and had lunch with Father Bill Devine, a priest of the Archdiocese of Boston who is on sabbatical in Rome. 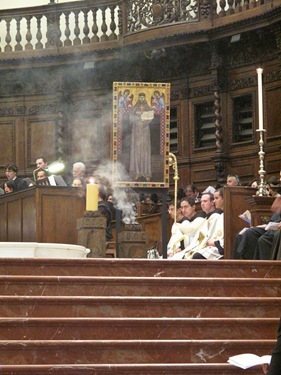 Our two seminarians there, Eric Bennett and Tom Macdonald, also joined us. 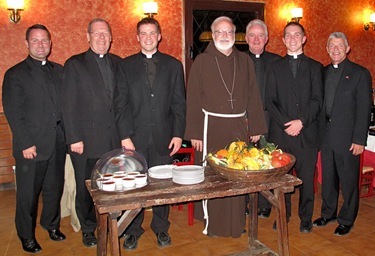 Later in the week we had another chance to have dinner with all of our men in Rome. 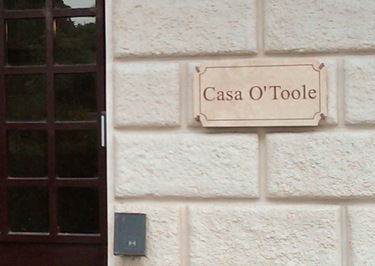 Then Father Devine invited us to visit the Casa O’Toole, which is the new residence for the institute charged with ongoing formation of priests ordained for over ten years. 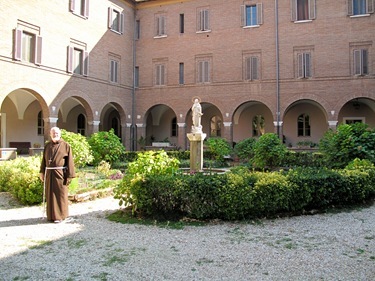 On Saturday I had lunch at the Generalate of the Capuchins. 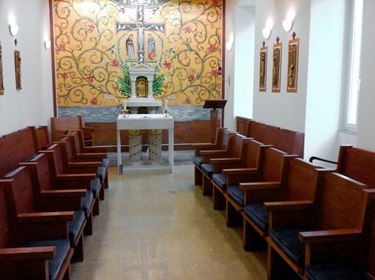 They also have a very nice chapel. 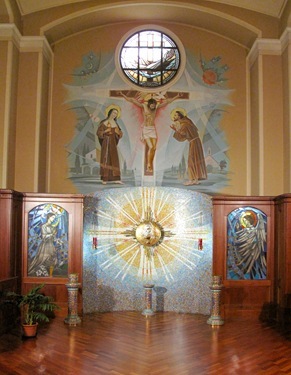 It may be difficult to see in the photos, but the tabernacle is shaped like the world. 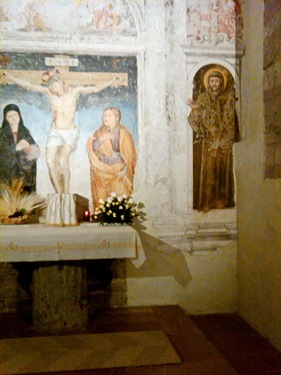 There is also the crucifixion scene with St. Clare and St. Francis painted on a mural behind the altar. 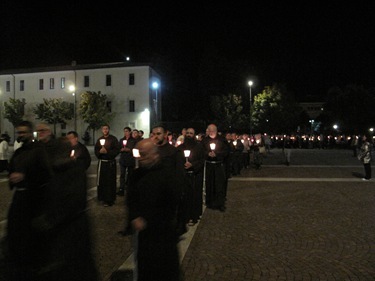 On Sunday, we travelled to Assisi for the Transitus, a nighttime commemoration of the death of St. Francis of Assisi. 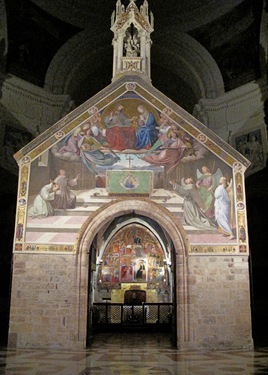 St. Francis died just next to the chapel of the Portiuncula, which is now housed within the Basilica of St. Mary of the Angels. 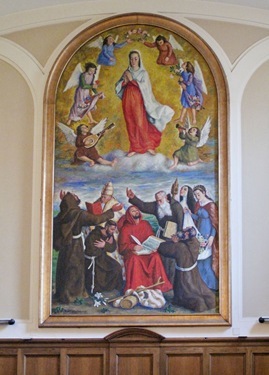 This painting hangs above the place where St. Francis died. 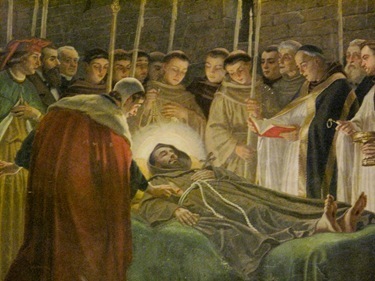 It is on the back wall of the outside of the chapel of the transitus, depicting the death of St. Francis, surrounded by the brothers holding candles, and showing his stigmata. 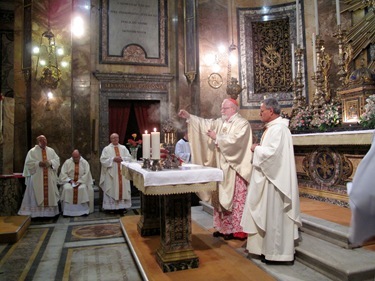 Luigi Bressan, Metropolitan Archbishop of Trento presided at the Solemn Commemoration of the Transitus. 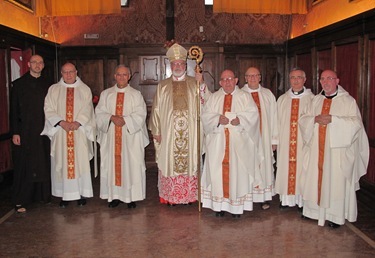 Bishop Karl Golser, Bishop of Bolzano-Bressanone, also participated, as well as Bishop Domenico Sorrentino, Bishop of Assisi. 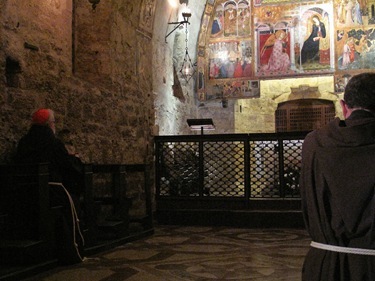 We were there for vespers and then we had dinner with the Conventual Friars. 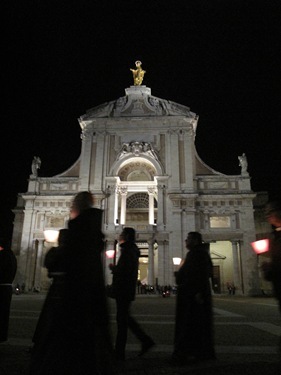 Then there was the Transitus service at 9:30 at night, which included a candlelight procession and sermon by Father Mauro Jöhri, the minister general of the Capuchins, who is Swiss. I have a video here that I wanted to share with you which explains the Transitus in a little more detail. 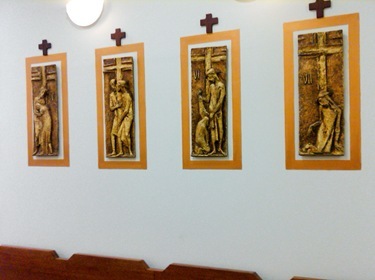 It depicts two other generals of the Franciscans talking about the Transitus. 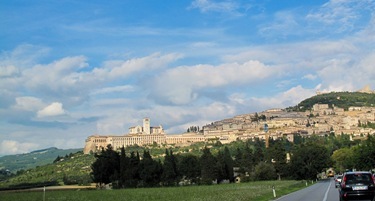 Monday, I went to the Basilica in Assisi for two Masses. 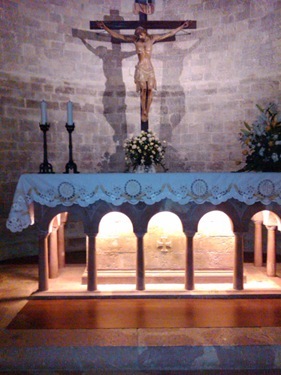 The first Mass was celebrated by Father Mauro in the lower church, near the tomb of St. Francis. 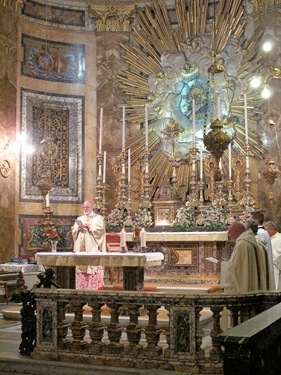 At 10:00 there was a solemn Mass in the Upper Church, at which I presided. 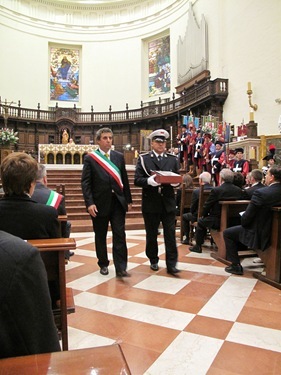 The main celebrant was the Archbishop of Trento, Luigi Bressan. 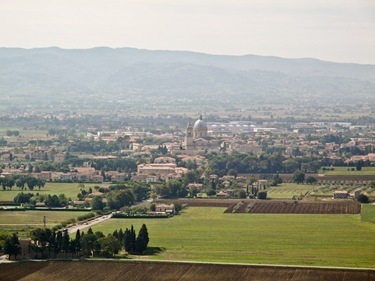 Italians come from the different regions of Italy because St. Francis is the patron saint of the country. 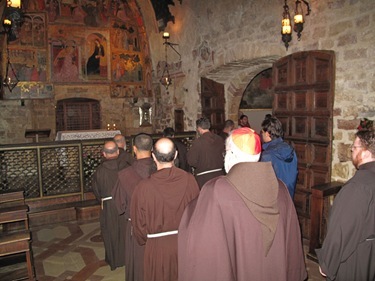 Each year a different town is chosen to come to pray for the Italian people and make an offering of oil that will be burned in a votive lamp by the tomb of St. Francis all year. 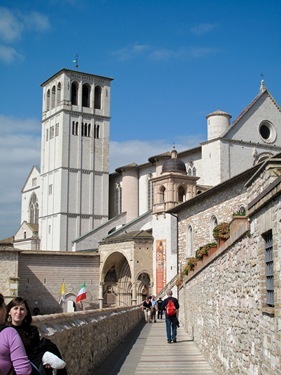 Then we visited the Church of Santa Maria Maggiore in Assisi. 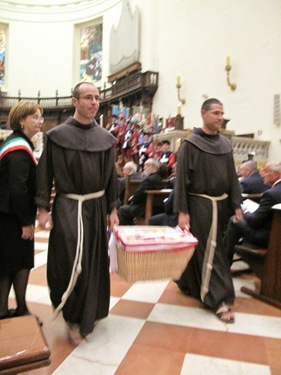 Bishop of Assisi Domenico Sorrentino recently gave the church to the Capuchins there, which was the old cathedral. 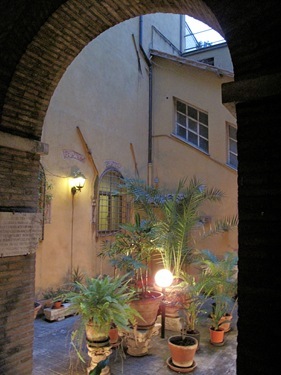 It dates back to the year 1000 when it was built atop the ruins of an old Roman home. 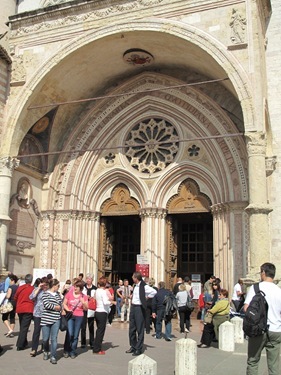 This is the church where the trial was held before the Bishop of Assisi when St. Francis gave up his inheritance and returned his clothes to his father and began his life as a religious. 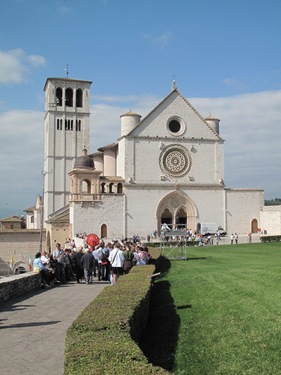 This was my first time celebrating the transitus and the feast of St. Francis in Assisi. It was very moving, almost like a retreat. 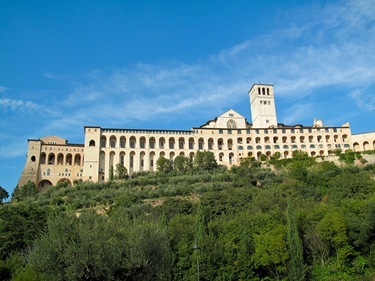 After leaving Assisi, I went to Rome for a meeting to prepare for our upcoming apostolic visitation to Ireland. That meeting took place this past Tuesday and Wednesday. We met with Cardinal Ouellet and representatives from the Curia, as well as the nuncio, and the four archbishops of Ireland — Armagh Cardinal Seán Brady, Archbishop of Dublin Diarmuid Martin, Archbishop of Cashel Dermot Clifford and Archbishop of Tuam Michael Neary — along with the four visitators — myself; Cardinal Cormac Murphy-O’Connor, the retired bishop of Westminster in England; Archbishop Terrence Prendergast, SJ, Bishop of Ottawa; and Archbishop Thomas Collins, of Toronto. 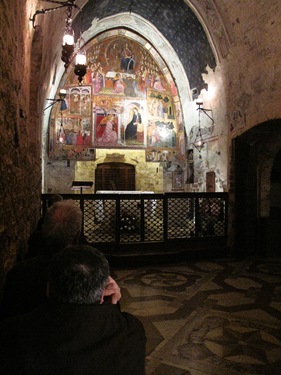 We spent two days working on the program and discussing the visitation. 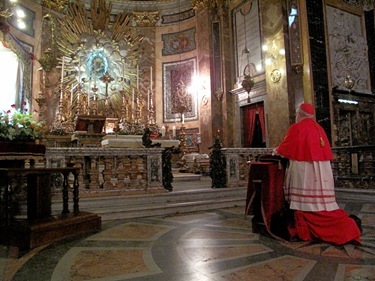 Cardinal Ouellet stressed the fact that this is a pastoral visitation, and we’re not there to repeat the kinds of investigations that have been begun by the Irish government and others. 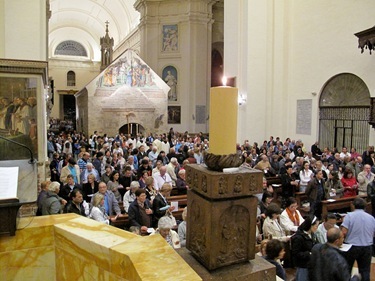 Rather, we are there to look at the Church’s response — what the Church is doing to serve the needs of the victims of sexual abuse as well as implement policies to guarantee the safety of children and renew the Church spiritually as they strive to, in a spirit of penance, bring reparation and prepare for their Eucharistic congress, which will be next year in Ireland. 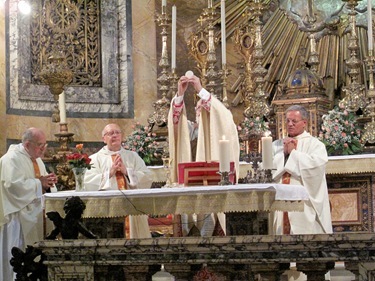 On 5 October 2010, the Prefect and the Secretary of the Congregation for Bishops and representatives from the Holy See held a preparatory meeting in Rome with the Apostolic Visitators named by the Holy Father for the Apostolic Visitation to the four Metropolitan Archdioceses of Ireland: His Eminence Cardinal Cormac Murphy-O’Connor; His Eminence Seán P. O’Malley, O.F.M. Cap. 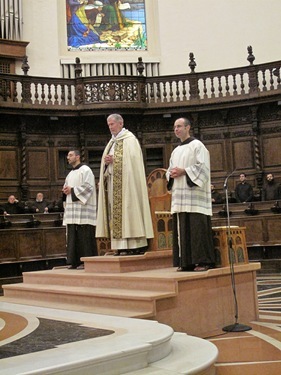 ; the Most Reverend Thomas C. Collins; the Most Reverend Terrence T. Prendergast, S.J. Mindful of the tragic abuse of children that has taken place in Ireland, the participants discussed the particular aspects of this important Visitation. Pastoral in nature, the Visitation “is intended to assist the local Church on her path of renewal” (Pastoral Letter of Pope Benedict XVI to the Catholics of Ireland) and is a sign of the Holy Father’s desire, as the Successor of Peter, to offer his pastoral solicitude to the Church in Ireland. 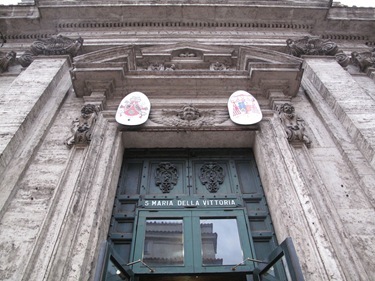 The Visitators will give particular attention to victims of abuse and their families, but will also meet with and listen to a variety of people, including ecclesiastical authorities, lay faithful and those involved with the crucial work of safeguarding of children. On 6 October 2010, as had been previously planned, His Eminence Cardinal Seán B. Brady, Archbishop of Armagh, the Most Reverend Diarmuid Martin, Archbishop of Dublin, the Most Reverend Dermot Clifford, Archbishop of Cashel and Emly, and the Most Reverend Michael Neary, Archbishop of Tuam, celebrated the Mass of the Holy Spirit together with the Visitators and Superiors from the Congregation for Bishops and the Secretariat of State. 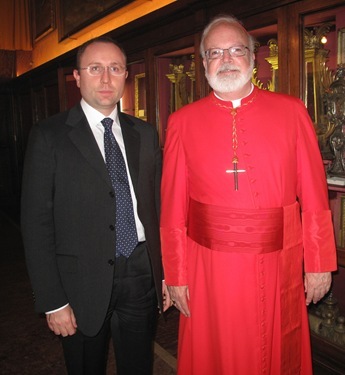 The meeting that followed, marked by fraternal warmth and mutual collaboration, summarized the discussions from the previous day and focused on the organization of the Apostolic Visitation and the Archdioceses involved. 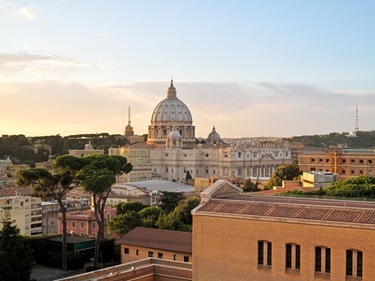 All participants are hopeful that this significant endeavor will be an instrument of purification and healing for the Church in Ireland and help to restore the trust and hope of the faithful there. 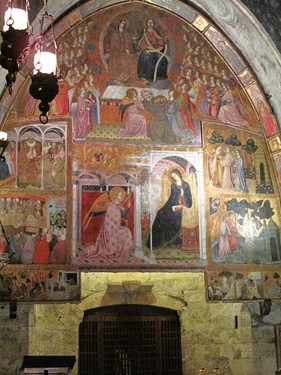 I would like to make an appeal for people to pray for the success of the visitation. Please pray that it will be a time of healing and renewal for the Church in Ireland and bring peace and a spirit of hope to Catholics there. I have been reading your blog for some time, and I want you to know what guidance it has provided me. I used to be lost. I felt like I was on a merry-go-round of options, never knowing which to chose. I was confused. I had lost my job, medical and Dental Plans. I am also a regular reader of your blog here in Vancouver, Canada. I am praying for your visit to Ireland and for the faithful Catholics there. May God grant you wisdom and insight and may His Holy Mother wrap you in her protective mantle. I am a regular reader of your blog and enjoyed seeing all the pictures in this week’s post. I attended the Justice Convocation for the archdiocese today and am grateful for your welcome video. The convocation was wonderul. Even though you could not be there, your commitment to this event was obvious. 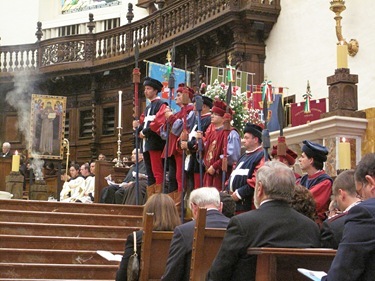 I hope you can post your welcome video and look forward to other pictures from the convocation in next week’s blog entry.